*Credit goes to bubba-loo of Deviantart for the base image. The first BATTLE ROYALE will consist of the first 108 pokemon on the chart, as determined on the Pokedex. Selected Pokemon would be pit against one another in a fight to the death, and if they get through all the rounds... they will be the CHAMPION, still alive after defeating everyone else, and will be crowned the first BATTLE ROYALE champion. It is an honour like no other. Hey guys, I'm trying to get my head around a new forum activity... I think it will work out really well, but there's just a few things I have to iron out before I can formally "announce" it as such. However, that's just the later part of the game that I need to work on, for now, can you guys vote for your favourite Pokemon? This part is an activity in itself, whooo! Anyway, I have a list of Pokemon here, and this is a really good way to make Psybucks. If you guys vote properly I'll give you 10 psybucks, with the potential to earn more! (I have many many more groups that need to be rated... so it could be a great way to get your bank balance up ) Just make sure you vote as soon as you see my posts, because I can be pretty indecisive and I might close voting early, later... etc... and I don't want people to miss out on psybucks or anything! I expect voting to be closed after the weekend, so 2-3 days before I give out the next batch of Pokemon to be rated. Last edited by DragonPhoenix on Tue Aug 21, 2012 6:27 am, edited 20 times in total. Group 1: -- Two adorable Pokemon, or two Poison Pokemon evolved from Pokemon that basically serve as wild encounter bait? Duh. Group 2: -- Butterfree is an all-time fave for being an adorable early-game god, and I used Sandslash as an internet handle in ancient times. Group 3: -- Charmeleon is kind of a jerk, so screw him. Between Paras and Kadabra, I picked Paras for being cuter and more timid. Group 4: -- Caterpie played a direct role in me becoming a Pokemon fan, and Meowth is more complex than half of the humans on the show. Group 5: -- Pidgey is cute but bland and basic, and between Poliwhirl and Poliwrath, I'll take the less angry looking version. I did the icons this time but would it be okay to write out the names in the future? Thanks guys Yeah it's fine with me if you use names as opposed to icons, just as long as I get the votes... Additional information would be good too (eg, commentary, reasonings, why you hate a certain Pokemon, artworks, etc..) but I just thought icons would make it "clear" what people were voting for. And since I think I've figured out the second half, let's just say I'm trying to cut down 128 to 64 Pokemon for a tournament style square off... There are heaps of ways I could pick out Pokemon but I decided to run numerically - creates a potential for more games if this is successful enough... anyhow shall reveal more at the start of the next batch..
Also, I'll send Psybucks at the end of every batch of Pokemon ratings, so I don't accidentally miss anyone out. These guys are actually among my favorite of favorite Gen 1 pokémon, probably at least in the top... 7 or 9. Of Gen 1 Pokémon I mean. No comments. Except I am a total cat hater. Whatcha gonna do. By the way, what will happen if you run out of psybucks? Group 1: - Not a big fan of any of these but these two are better than the others. Group 2: - I'm not a huge fan of Caterpie's line, plus Sandslash looks pretty awesome. Group 3: - I don't like Paras and nidoran doesn't appeal to me. Group 4: - I don't like Meowths and anything is better than Caterpie. Group 5: - Growlithe is one of my favourite Pokemon and Poliwrath is up there as well. Eh, I don't care too much about Psybucks. I will gladly do this for the lulz. From Group 1: - For no other reason other than I don't like the other two very much. But Beedrill has always been cool with his arms that pierce the heavens, and Tentacruel's the gangster of the sea. I mean come on, you can't beat that. From Group 2: - Both of these guys are real overlooked and underestimated bros, especially as in-game team members in Kanto games. Sure, Sandslash is overshadowed by Dugtrio and Butterfree by Venomoth, but that doesn't mean they aren't totally amazing in their own way. From Group 3: - They're both pre-evolutions to totally cool and awesome Pokemon. Well, they all are actually, but I feel more attachment to these two, mostly because of the TCG. I don't want to go too much into detail here (mostly because I don't feel like it right now). From Group 4: - Wow, I dislike everyone in this group. However, Ninetales has its perks *coughweatherwarcough* and Pidgeotto is the pre-evolution to the most awesome bird Pokemon ever, so yeah. From Group 5: - Polibro and Polibro-er. That is all. G01: very strongly qualifies and edges out Lickitung and Tentacruel to advance to the next stage. G02: and both almost unanimously qualifying, leaving Metapod and Spearow behind. G03: and show their strength in this group, easily defeating Nidoran-M and Paras. And at this stage, it doesn't look unlikely that I'll run out of Psybucks. And I'm so confident I won't, for the next round you all get a double bonus, ie, 20 psybucks for votiing for your favourites. But yeah.. also I'm sending Psybucks to everyone (except Frost), so if you really don't want them, just send them back to me. Group 6: Sandshrew and Vulpix -- two of my random favorite unevolved Pokemon because they're both cute and nostalgic. Vulpix was one of my first TCG cards ever and Sandshrew_88 was my first Internet screen name in LIFE. Group 7: Clefable and Seel -- both top twenty Pokemon for me. Clefable is Clefabulous and I love cute Pokemon who are actually not completely worthless in battle. And Seel is the pre-evolution of my favorite Pokemon ever so, duh? Group 8: Ponyta and Mankey -- Ponyta and Rapidash are my favorite Fire-type line of Generation I because fire horses are cute and original. Mankey... isn't a pile of sludge or Golbat, I guess. Group 9: Wigglytuff and Nidoking -- Wigglytuff was an easy choice for being Clefable's less useful but cuter little brother (and ab unny <3). The other three are more toward "alright" territory but Nidoking is cooler than the rest. And he's purple. Group 10: Parasect and Dodrio -- least exciting group of this round for me. Parasect was one of my favorites back in the day even though I've cooled toward it a bit. And I like Dodrio's design more than Onix and Poliwag which are again in that "alright" territory only. I like Clefable. And Blastoise is cool; but not for me. Mine is Charizard. Blastoise belongs to Blue. Yoom-TAH! And, sure, whatever. Respectively. Poliwag! It's a baby Politoed. Duh-doy. Dodrio's fine. Group 10: Parasect & Dodrio - ...Comparatively better designs? Meh, not a big fan of Kanto Pokes. From Group 7: - Both of these guys have been long-standing favorites of mine...Blastoise because he's a super-amazing shellfish, and Cloyster because he's a super-amazing shellfish. Well, you get the gist of it. They're both very cool. From Group 8: - It's very hard to pick from a group of Pokemon I all dislike equally, but I'll just pick those two because, unlike the others, I like the evolutions (Muk and Crobat) of the ones I picked for various reasons. From Group 9: - Out of all the Gen 1 Pokemon, Nidoking is a strong candidate for the manliest Pokemon for Gen 1 to have introduced. (A lot of Gen 1 Pokemon are pretty cool really, but none quite as manly as this guy.) As for Wigglytuff...have you ever played PMD2? He has superpowers, man. SUPERPOWERS. And they trigger whenever he gets non-happy. That's scary stuff. From Group 10: - I am honestly not sure why I picked these guys. I don't like any of this group very much, save for maybe Dodrio. I dunno, it was a tough choice. Oh right, Parasect served me well in the TCG, as I mentioned above. And Dodrio too, except Dodrio's more recent history. Last edited by DNA on Mon Apr 02, 2012 9:01 pm, edited 2 times in total. 6. <-This one looks like it has an imprint of a wall on its back! 10. <-Epix rock monster; thought it was awesome the first time I ever saw it! By the way, should I put more comments in? Sorry I couldnt vote last time. My phone is a douche. Group 6: I name it Cutekiller everytime because I can effectively use it as a sweeper. And its cute. Its evolution is boss. Nuff said. Group 7: I dont think I should give a reason. If you dont understand my reasoning, lurk moar! These groups are giving me nostalgia like crazy! Seel is a very good pokemon. Group 8: Ok monkey (Background: MANKEY! ), your going down! Pikachu, use Thunderbolt on Monkey! (MANKEY!) SHUT THE **** UP! I love Smosh. One of the best vids I've ever seen. Cuz Golbat is derpy and Grimer fails at life. Group 9: Strongest of the group! Very good at annoying opponents because their pokemon cant stay out longer than three turns. Group 10: Biggest pokemon from 1st and 2nd Gen! I found Parasect to be quite a sweeper in Gen 1. Comments are optional, but I do consider them in such tie breaks and other decisions later on, and besides I like reading them, they're great. But no, comments aren't required, so your post is fine. G06: , an unevolved Pokemon, proves he's a fierce competitor tussling out Persian, whilst Vulpix and Kingler are dead locked 4-4... based on tiebreaker (my choice).. I'm sending through , because the episode where Ash battles in the Pokemon league and winning his first round with Hyberbeaming Kingler sticks in my mind. And plus, yes I agree that Crabhammer is a very cool move. Vulpix fans please note that this was quite a hard decision for me to come to, and I didn't like doing it. G07: We got a water group here! Original water starter pulled through as I expected, with also showing his popularity against Cloyster and Seel. G08: Once again the unevolved Pokemon shone through in this group, with qualifying first, and -again- we have a tie between Golbat and Mankey! Even though Golbat was my first wild shiny I found which I then evolved (which became my FLY slave).. gets the nod from me, being a huge asset in Pokemon Yellow (Low Kick @ lv9 against Brock) and plus he was hard in the anime. Grimer was never a threat, only scoring 1 vote. G09: Emerging as favourites for the competition as a whole, and dominated this group, leaving no love for opponents Gloom (1 vote) and Rattata (0 votes). After reading so many nuzlocke comics I began to like rattata, so I guess it's unfortunate he was placed in a group together with two other great Pokemon. G10: In what many of you guys described as the most "meh" group, (who, happens to be my 3rd favourite Kanto pokemon..) lead the pack, with also crossing the line. Unfortunately for the poli-fans, Poliwag feel short whilst poor Onix only received 1 vote. Half way there! there are 27 groups in total, each comprising of 4 Pokemon, from #1-#108.. Anyway, I figured because I know how everything is going to run now, I'll give you an insight to what I've been trying to organise. I've always liked watching things like the tennis, where there's a knockout kind of format, and after watching Hunger Games I'd thought I'd try and start a little activity to get a something happening, so I'm presenting Psypoke's very first (? maybe) fight to the death.. or, as I'm going to call it, THE BATTLE ROYALE. 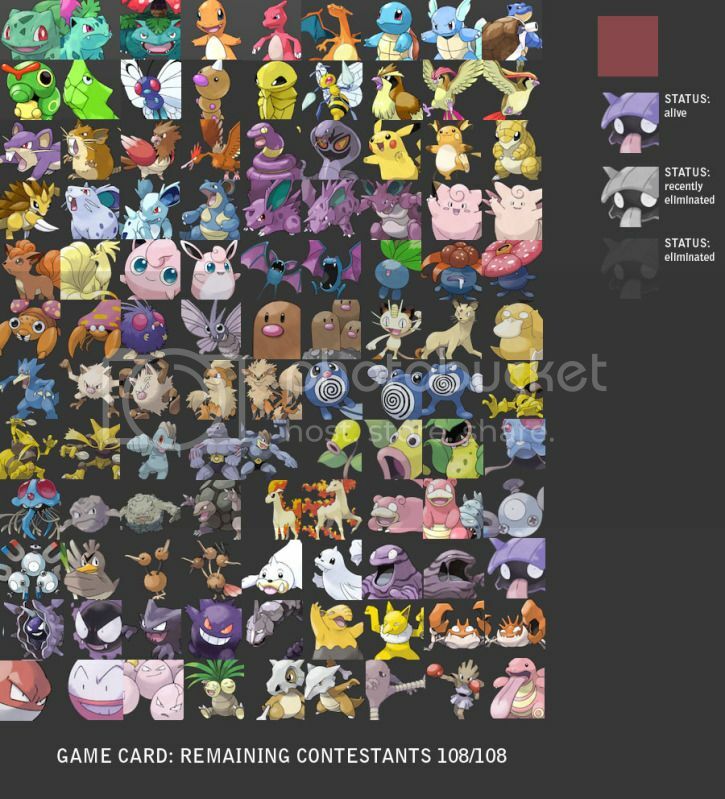 The first BATTLE ROYALE will consist of the first 108 pokemon on the chart, as determined on the Pokedex. I know that there could be other ways to set things like this up.. but I'm setting like this because otherwise this selection process would be way too long. The second season (if this is popular enough) will feature Pokemon 109-216, and so on. Selected Pokemon would be pit against one another in a fight to the death, and if they get through all the rounds... they will be the CHAMPION, still alive after defeating everyone else, and will be crowned the first BATTLE ROYALE champion. It is an honour like no other. PRELIMINARY STAGE (WHAT IS HAPPENING NOW): Each pokemon will be randomly put into a group of 4, (27 groups of 4), and you all have to vote to send them through to the next round. Rounds will run concurrently, and each group will send through 2 victors. There are also spots for 10 wildcards (5+5), who may have a second chance to enter the main draw. As for those who don't make it, they will die, and will be blacked out on the game card. So that's why you have to vote for your favourite, as only you can save them from their horrendous fate! A bracket will be drawn up, with 64 spots, and the top 16 pokemon will be seeded, as accordance to their placings on Psypoke Idol. If a Pokemon is deemed to be on "equal" with another, I will be referencing their performances in the Preliminary stages. Prior to each "battle," there will be a showcase, pointing out each Pokemon's strengths and weaknesses, pointing out where the smart money should be placed on. Hopefully we'll even have some "celebrities" join us on the show, giving us their expert opinion! Interviews will be conducted with the contestants after the 1st round, to gauge their feelings and personalities about being in the game, to hopefully sway your opinion and hopefully gain some sponsors! This will be more than a simple popularity contest.. "battles" will be held out on various arenas, which could be an assistance or a hindrance to certain Pokemon. A Pokemon's moves, stats, abilities, will all play a part in their survival in the BATTLE ARENA. WHAT ARE SPONSORS? HOW MANY ROUNDS ARE THERE? IS THIS JUST A GLORIFIED PEC? WHY ARE YOU GIVING ME PSYBUCKS WHEN I CAN'T SPEND THEM ON ANYTHING? I'll reveal a bit more next time, but for the meantime, a successful batch of Pokemon ratings for Groups 11 to 15 will net you another 20 Psybucks! PS: Please PM me if you haven't received Psybucks. Generally I send them out after everytime I post, and if I've missed you it's a genuine mistake. Also I'm on Easter break now, so I can answer any questions you may have. Not sure if I understand everything perfectly (then again, this is the type of things that you can understand only when you partake in one), but seeing how much effort you must've put in, I can say I'm definitely looking forward to it! Group 11: & - Oh Hocus, I'll never forget the day you swept Agatha with mere Psybeams. That's some raw power. Group 15: & - I dunno...don't want to give the Shellfish family more support? Doduo's pose in Sugi's art looks cute and Clefairy...is...decently...design...movepool...I don't know anymore. Hopefully I haven't bored you with my longwinded explanations...yet. I'm setting up a knockout tournament (exactly like this) which pits Pokemon against each Pokemon, but will be differentiated from PECs in that there are many other factors that may or may not alter performance. I'd probably liken this activity as something like the lovechild of Psypoke Idol and the XFactor, in that there's an incentive for people to start voting, getting involved more with the activity. Like I've said before, the Hunger Games was a big inspiration to this, but I'll reveal more when I release batch #4 (Groups 16-19), most likely on Sunday (my time). Group 11: Go psychic types! Group 12: A boss with the bones! Group 13: The only Ghost for two gens. Two gens! Group 14: OH **** YEAH!!!!! Because I dislike the others more. Group 15: Evolves into Blastoise. Nuff said. It looks like its dancing, and it amuses me. From Group 11: - Well first off, Alakazam is just...Alakazam. The OP Pokemon of the RBY days (excluding Mewtwo for obvious reasons), and even in future games, a single Alakazam can take you a VERY long way. Gen 5 gave him an amazing buff in Magic Guard, allowing him to sidestep external damage and even Life Orb. As for Slowbro? He has "bro" in his name and he can spam Amnesia-Psychic in RBY (and even Amnesia-Surf)! That alone is to be envied. From Group 12: - I've actually started using a Victreebel in my latest run of RBY, and he's actually served me very well. Weepinbell has been nice to me as well. As for Krabby? He's one step down from the epic Hyper Beaming Kingler. And he pinches people while they sleep. Whatta guy. From Group 13: - Arcanine was the very first Pokemon to get Extremespeed, and ever since then he has continued to be amazing as ever. For a "regular" Pokemon, he has very VERY respectable stats, earning him a comfortable niche. As for Gengar? He's GENGAR. The master of badassery. You just don't talk back to that.